Fantastic adventures await Wendy and her brothers when Peter Pan, the hero of their stories, whisks them away to the magical world of Never Land. After following Peter and his feisty sidekick Tinker Bell passed "the second star to the right and straight on till morning," they explore the island and Peter's secret hideout with the rambunctious Lost Boys and leap into high-flying battles with swashbuckling pirates and the infamous Captain Hook! The film strip portrayed in the image above is only an example of the film cells you may receive. Please note, the cells may vary from piece to piece because they are hand selected from reels of film. This item contains clips of the film and portrays memorable images and scenes all on a stunning descriptive plaque. These elements have been double mounted and placed within a beautiful black wood frame measuring 7-inches wide x 5-inches tall. 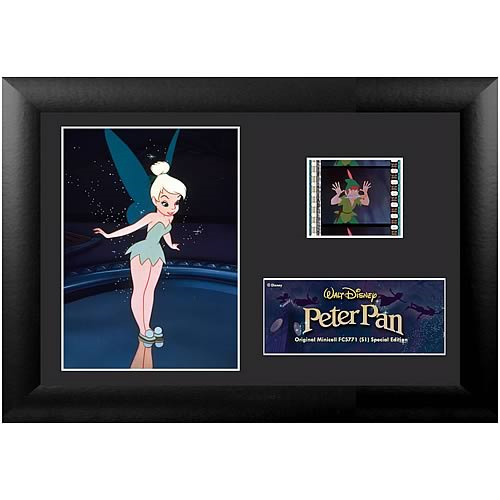 The Peter Pan Series 1 Special Edition Mini Cell even comes with a certificate of authenticity.